An enterprise ASP.NET web application provides server administrators’ ability to access the server under some specific privilege set; Server admin input their NT account information (domain\account + password) on the page, we need get WinNT Access Token and then impersonate this server user, so that we acquire its specific privilege and do the things ONLY THIS ACCOUNT CAN DO. We developed a Windows Service which needs internet access periodically, but a specific user sets an Sock5 proxy to access internet, then your Windows Service needs to know the Socks proxy information so that it could access internet, you must impersonate this user and read the settings. Impersonation is the ability of a thread to execute using different security information than the process that owns the thread. Typically, a thread in a server application impersonates a client. This allows the server thread to act on behalf of that client to access objects on the server or validate access to the client’s own objects. I read many articles and blogs and wrote an ImpersonateHelper class to do impersonation work, during the investigating I noticed that very few articles/blogs refer a complete impersonation process, so I decided to write one that refer as more details as I can, and actually my code was a code snippet combination came from 10+ sources . 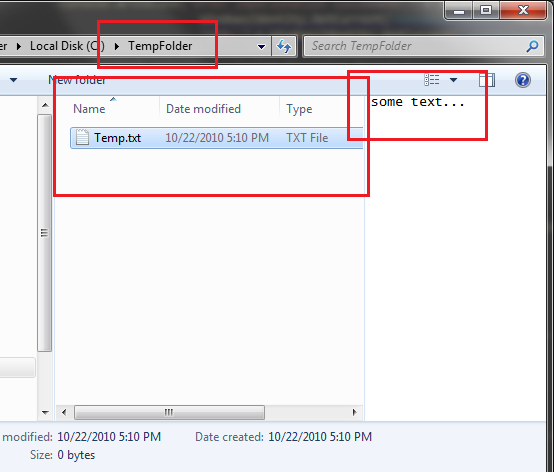 Create a folder “C:\TempFolder”, modify its default privilege, ONLY TempUser has full control of it, I will create a text file under this folder after impersonating to prove impersonation is successfully. 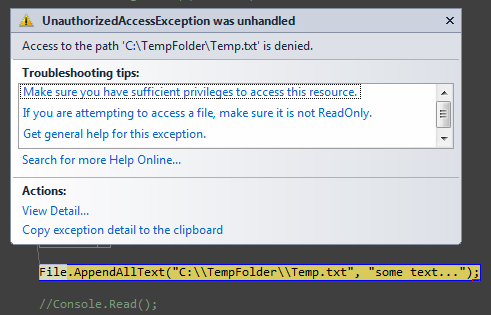 Notes: After setting TempUser as the only owner, my current account cannot access this folder except privilege promotion (I disabled UAC, if UAC is enabled, a prompt window will pop up and as for Admin confirm). 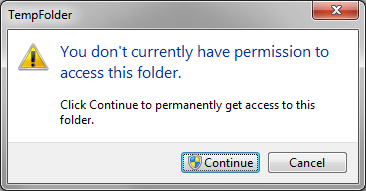 In additional, I tried to access this folder programmatically under my account, UnauthorizedAccessException will be thrown! 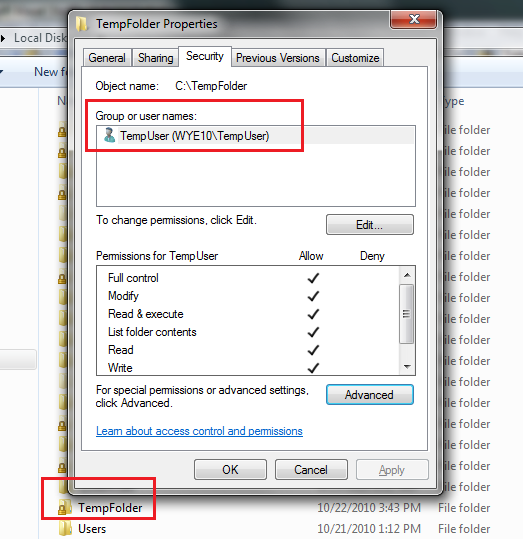 I will access TempUser’s HKEY_CURRENT_USER and do registry key creation, reading and deleting. We need invoke three very famous Win32 API: LogonUser, DuplicateToken and RevertToSelf. /// A process should call the RevertToSelf function after finishing any impersonation begun by using the DdeImpersonateClient, ImpersonateDdeClientWindow, ImpersonateLoggedOnUser, ImpersonateNamedPipeClient, ImpersonateSelf, ImpersonateAnonymousToken or SetThreadToken function. /// If RevertToSelf fails, your application continues to run in the context of the client, which is not appropriate. You should shut down the process if RevertToSelf fails. /// This member is used as the base name of the directory in which to store a new profile. /// Pointer to the path of the Windows NT 4.0-style policy file. This member can be NULL. // to unload. For more information, see Registry Key Security and Access Rights and Registry Hives. 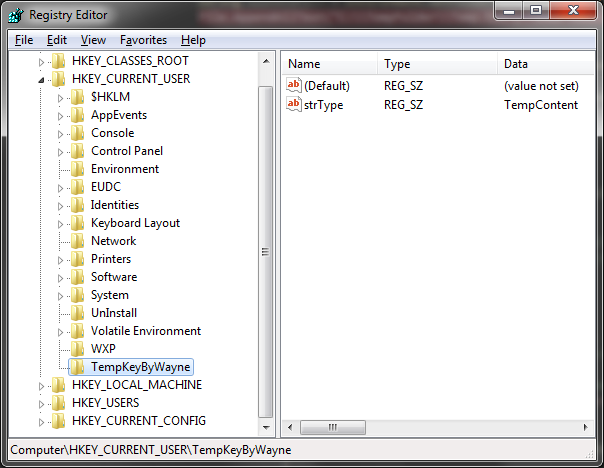 // Access file system %appdata% will be "C:\Users\TempUser\appdata\Roaming"
“TempKeyByWayne” was created under HKCU.